The complexities of a hybrid car far exceed those of a typical gasoline powered car. This is because of the electric component of the car. By nature, a certain mass of batteries contains less energy than an equal amount of gasoline. This causes the car to be much heavier than its gasoline counterpart. Many types of hybrid cars exist. The McGill Formula hybrid is a series type. Unlike some hybrid cars that can run on gas or electric power, the McGill car drives exclusively on electricity. The sole purpose of the gas engine is to recharge the batteries or to provide electricity for the motors, it is not mechanically linked to the wheels. This means that the car can drive even when the engine is not running. The engine is essentially a range extending device. 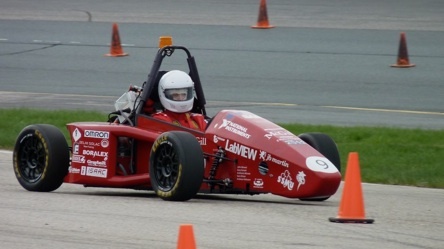 An electric motor powers each of the rear wheels of the McGill hybrid car. This was implemented for several reasons. It allows the elimination of a single bulky (and heavy) motor in favour of two smaller, lighter motors. The only downside is that it necessitates 2 transmissions. Conversely, it can accomplish the same task as a common differential by transmitting more power or speed to the outside wheel when the car is turning. This improves handling. The type of batteries used in the car are lithium ion type. This is the same type found in most modern laptops and cell phones. Batteries are constantly improving in terms of energy storing capabilities and lighter weight. Lithium ion are the best compromise of weight, energy storing and price at the moment. Why doesn’t it have Formula One style wings? 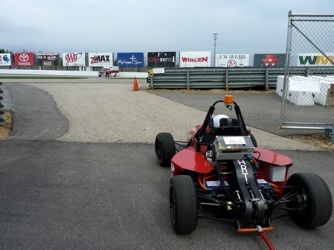 The events of the Formula Hybrid competition do not take place at very high speeds (below 80km/h). Due to these low speeds, the amount of air traveling over the car is not great enough to take advantage of the downforce created by inverted wings. Even F1 cars do not benefit greatly from their wings at speeds below 120km/h. And at speeds below that, wings are a disadvantage as they create drag and add weight. But they do look cool.